Ready to see the impact of your consumption on the planet, sign-up for the 15 day #SaveMoneySaveThePlanet Project. You are signed up for #SaveMoneySaveThePlanet Project. I’m proud to say that I have not used a produce bag in over 2 years. Although, admittedly prior to that I put EVERYTHING into those tiny plastic bags. It just never occurred to me not to. For years as a child, I tagged along as my parents were doing the grocery shopping and we always placed produce in a bag. It didn’t matter what it was. Then, somehow, a light was turned on and I started questioning why I also did that. I think that’s one thing we all have to realize when we move towards a different lifestyle is that many of our current habits are because of past influences. Not a fault of our own. It’s just how our parents lived and it’s how we also learned to do things. While seemingly small and minor, the use of produce bags adds up to waste especially when for many of us produce bags probably have a life span of 15 minutes to an hour. It’s also strange to me how we’ve been scared of bacteria and dirt. Our produce travels hundreds of miles away and gets exposed to a wide range of chemicals yet we want the last mile to be as clean as possible. As we all know, vegetables and fruits have their own protection and covering, essentially nature’s packaging. For me these bags work well for smaller items like Brussels Sprouts, string beans or anytime you are grabbing a multiple of items. The bags also work well for bulk items like grains, nuts and rice. It’s essential we start re-thinking some of our habits to reduce waste. For full transparency, this product was provided for FREE in exchange for a review. The review is my own. WowE LifeStyle is an environmentally friendly shop that sells products that raise awareness for nature and the environment. It was founded by a young family who were looking to create something that their children and the future generations could stand behind. Came to me shipped in a small cardboard box without any plastic packaging. Filler was brown paper. The tare weight is neatly printed on the side labels in both ounces/lbs and grams. Having this was very helpful as I had taken mine overseas where they weigh things in grams so it was easy to find the weight of the bags to deduct. 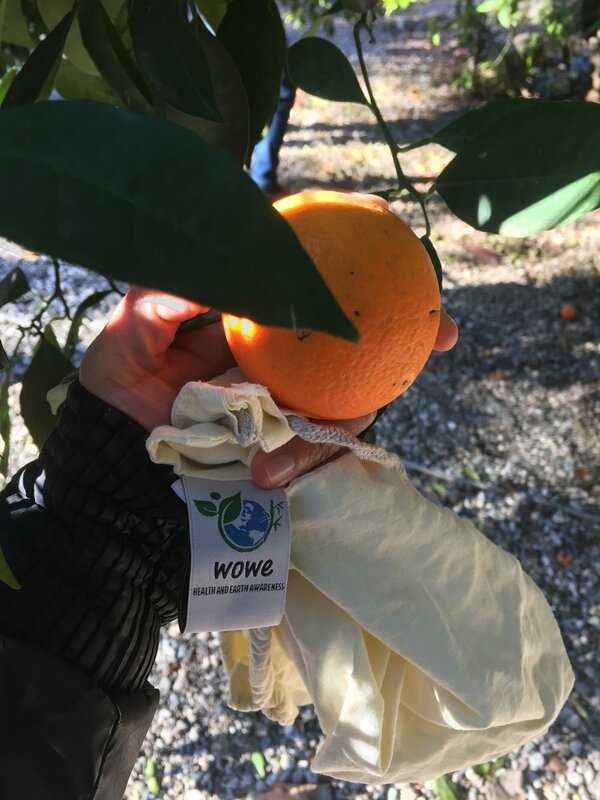 My WowE bags came in handy when we happened by an orange tree and were able to pick up from fresh oranges and mandarins in the South of Turkey. The WowE reusable bags are a good part of a zero waste kit to help reduce plastic use and additional waste. This was my travel kit while in Turkey. 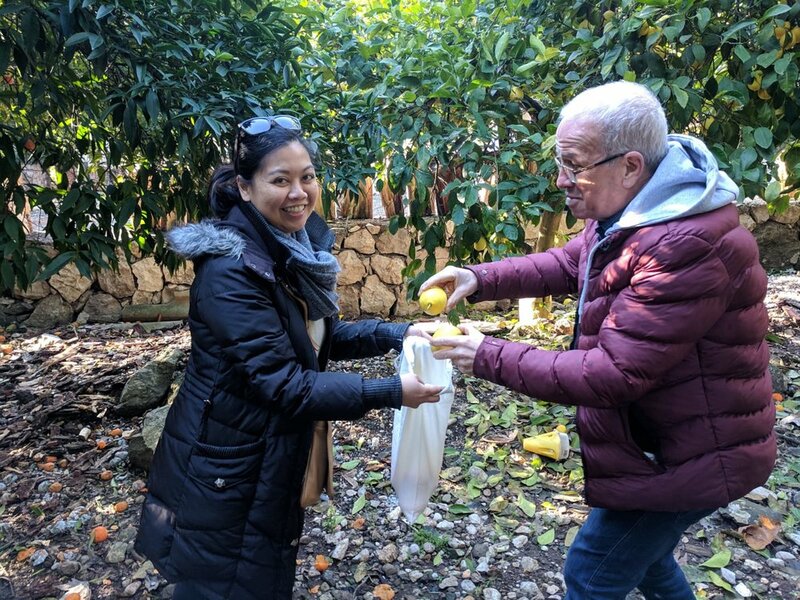 My father-in-law helping me pick fresh lemons in Antalya, Turkey, directly into my WowE reusable bags. This is a buy for me. It’s a versatile set of bags that you can use for pretty much anything. While their #1 purpose might be for produce, they can be use for bulk grains or even to collect fruit from nearby trees. I’ve also used it for bread as it is large enough for some loaves. It’s easy to wash and clean. I just place it in the washing machine along with dish towels and regular towels. Have you tried this product? What are your thoughts? Join the bandwagon and start simplifying your life today! Your best life will be found under all of that stuff! You are signed up for Project: Be Minimal! The do something project is committed to conscious consumption. While ads run on the site, please consider what you are buying? do you already have it? can you buy it secondhand? can you do without? Ⓒ 2016-2018 The Do Something Project, a division of Agopcan Solutions, LLC. All rights reserved.